Thermoluxe has been developing contemporary doors for decade. 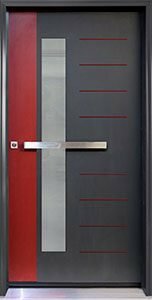 This new line of revolutionary designed doors has taken the entry door market by storm and turned out to be a true success among our customers. We manage to accomplish the difficult task of manufacturing heavy duty, durable doors with cutting edge style. These doors can be complimented with triple glass inserts (that are as thick as the doors and energy saving), PVC pieces or stainless steel, which makes this collection perfect for the homeowner with a more modern style. Such doors were designed and build for the North American market and they are in full compliance with the industry’s performance and safety requirements. Architec series is all about stainless steel decor in entrance doors. We designed Architec models using versatile decorative stainless steel panels and lines fused with the door surface. Architec doors can be made from either fiberglass or steel and are available in multiple configurations. Stainless steel design in this collections can be optionally routed into the door. Avenue door series features glamorous and stylish entry doors with glass inserts surrounded by stainless steel frames. Glass inserts and decorative frames around it become the focal point. Laminated glass is also available. Doors from Avenue series are available in both fiberglass and steel and can be built in several different configurations. Our customers can benefit from an upgrade to impact rated doors and glass. In Diagano series our main design focus is door glass. The acid etched glass inserts take most of the door surface, they have more complex and intriguing shapes, and stainless steel frames mounted around them do not extend beyond the insert perimeter, they play an important design function within the glass area. Diagano doors can be manufactured from steel or fiberglass in a variety of configurations.